Two stories; first is a short, about six pages, which features Captain Strange, a street pirate, and finds him "hanging around" by the end. Next is the main story which I've read in the complete collection editions where Dave the Orangutan becomes popular because he can predict the results of competitions and ends up predicting that he, who isn't even nominated, will win the election to become mayor. We start with the main story which jumps into one already in progress. A brief summary commences then we find Judges Dredd and Anderson in the future with a time machine. 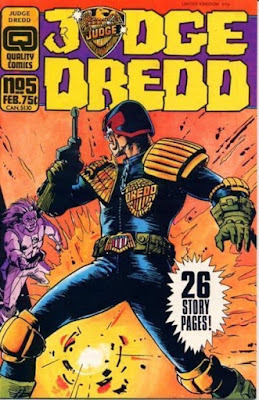 Here we discover a Dredd clone and vampire Judges taking over the world. The story concludes here and of course, Dredd always gets his man (or, er, clone). I don't remember reading this one. Then onto a 5-page short featuring Uncle Ump's addictive candy. This one I do recall. 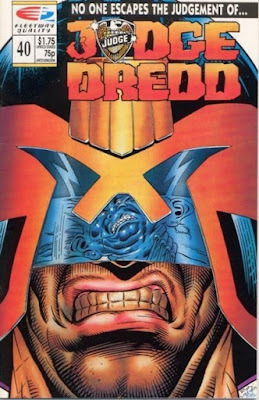 I always get a hoot out of reading Dredd! One Judge Dredd story here involving the mafia and a taxidermist. I don't recall reading this before. It's a pretty straight story. 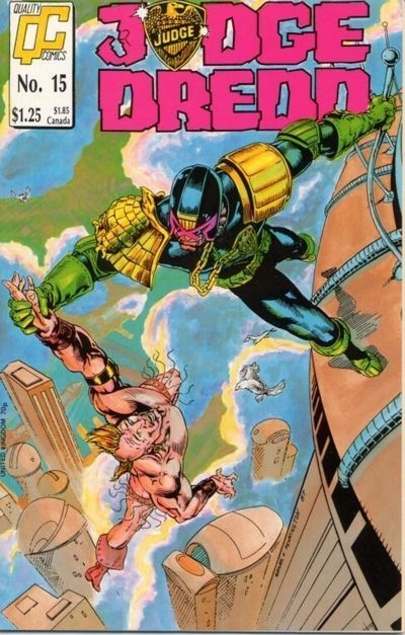 Someone even gets away with an illegal act, right under Dredd's nose! The book ends with a strange Tharg tale.